Wednesday, October 30th marked the 10th anniversary of Wicked the Musical on Broadway. I was quite happy to celebrate that moment as Wicked is one of my most favorite stories ever told. People often ask me why I am so passionate about Wicked. It has to do with more than the Wizard of Oz, two witches and a dog. It has to do with someone coming at just the right time to give one struggling girl a glimmer of hope that she could defy gravity. My first time seeing Wicked was in April of 2010, not long after my 40th birthday. It was my way to celebrate the big 4-0 because I had never treated myself to anything like this. With my backpack and walking shoes, I took a train from Boston to to New York City, walked up to 52nd Street and Broadway and found my way to the Gershwin Theater. By the third note of the score, Wicked had already taken me into a green city filled with the magic of hope, music, laughter and tears. Mandy Gonzalez’s portrayal of Elphaba had me feeling vulnerable, open and real, like someone was finally listening. Elphaba, Glinda and the entire cast, took me on an incredible journey and grabbed my heart and breath along the way. I remember not wanting to leave the theater because of how wonderful I felt in the moment. It wasn’t until September of that same year when Elphaba truly had an impact on my life. I was a girl in a different place, different culture, different economic level and different universe. I was working in a place where I desperately tried to fit in, to please the people, to do as they demanded and make it all right. No matter how hard I tried it was never enough. Their tension and fear had been brewing for a couple of years and now their target was me. I was in their crystal ball of revenge. They worked hard to control me in conniving, painful and manipulative ways. I was bullied, harassed, embarrassed, shamed, ridiculed and made fun of in public and private; all for being different, for caring too much, for not having enough, and for not being like them. The harder I worked, the worse it got. They ridiculed my speech. They criticized the way I looked, the way I spoke, the way I led, and the way I cared. No matter what I tried, it was never enough. Whatever went wrong was my fault and never theirs. Shame doesn’t describe the level of darkness where they took my heart and mind. The feeling of worthlessness can only begin to describe the way I was made to feel. I was nobody. I wasn’t worthy enough for them to treat me with even a speckle of kindness. Friends weren’t around. They left and became silent in their own little worlds. Family didn’t call, didn’t visit and stayed in their corners of life. People who said they would be there, left when they saw the blood. The few I trusted most, I was never able to reach out to for fear of repercussions. The beatings and hate got worse with each step I attempted to take. The scars were deep and raw. Things got worse when I defended myself, tried to care for myself and when I tried to stand up for what was right. In order to “survive” I had to remain silent. I had to stand in the ring and take the hits all on my own. Due to the curtains of a confidentiality agreement I had to sign, the wizards were able to hide behind their masks and towers. As far as anyone else was concerned, things were fine. Their lives went on as normal. However, the pain and weariness on my mind, body and soul were insufferable. I was broken and I wanted to give up. 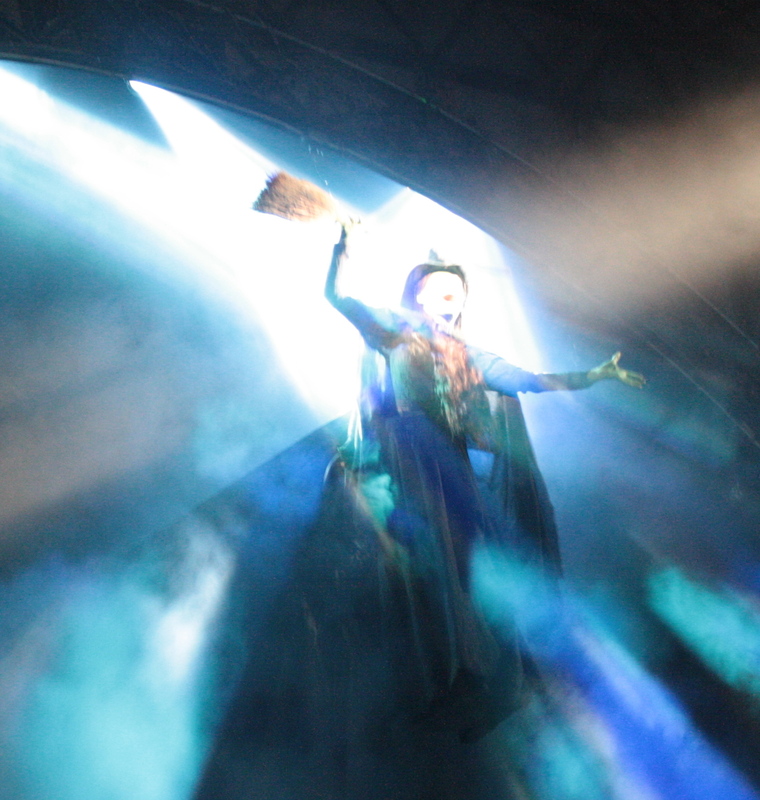 Then Elphaba flew into town when I went to see the national tour of Wicked in Boston. I now completely understand why the wicked witch became evil. What happened to her, happened to me; from the mockery and tears, to the anger and resentment. I changed. I became I person I never wanted to become. The shame, the horror, the pain of being reminded that I looked different and felt different from all the others was excruciating. Elphaba went through the same thing and we had to pay a horrible price. There were several times through the musical that I cried. 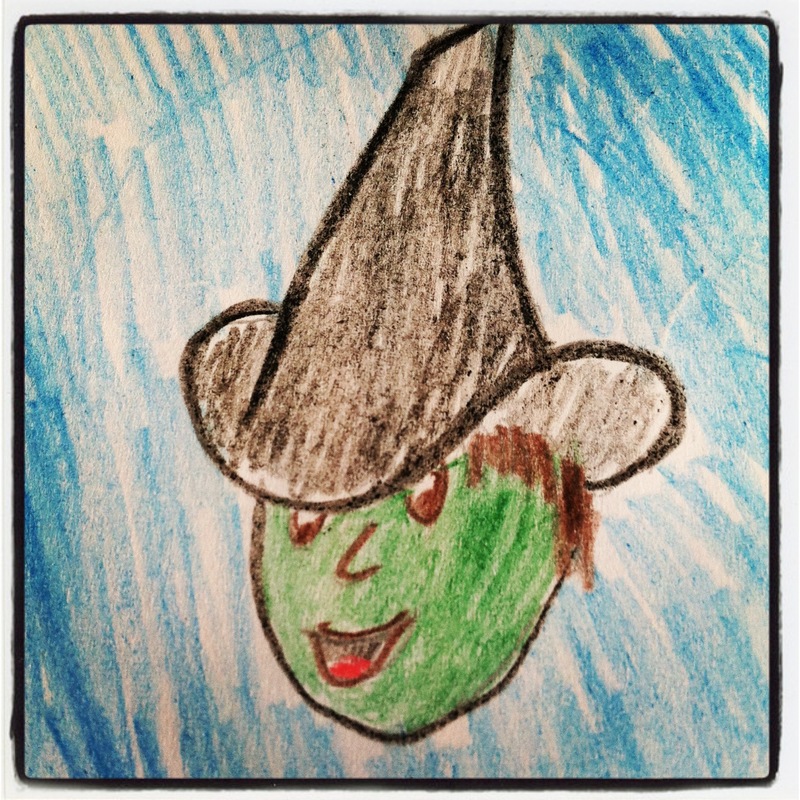 The first was when Elphaba started to fly and sing, “Defying Gravity,” her anthem of freedom, strength and resolve. 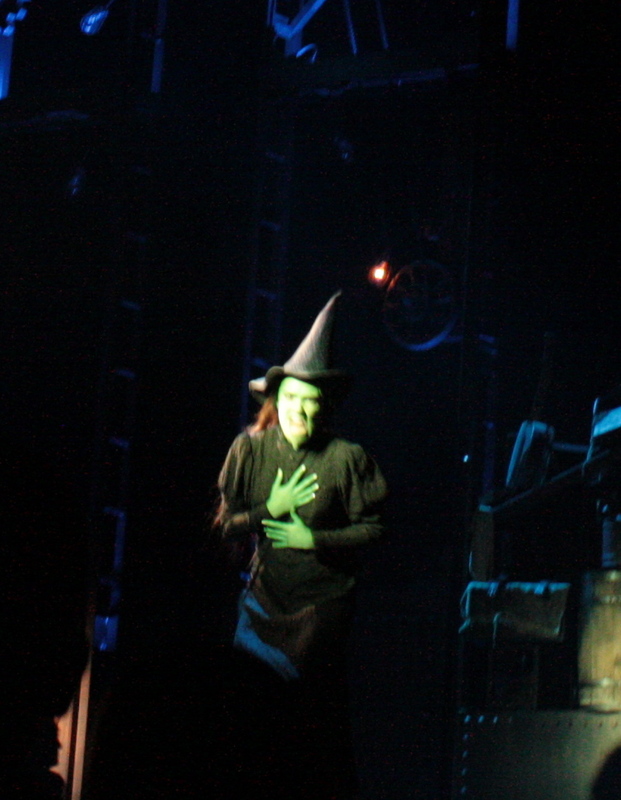 When she belted out the anger and defenselessness of “No Good Deed,” I was screaming right along with her. Then when the bucket of water was thrown on her and Elphaba died, I knew then and there that I had the same feelings of grief, pain and suffering. A part of me died right along with her. Wicked allowed me to escape into a world where I found someone who understood what I was going through. Elphaba showed me that there is hope in the midst of the hurt and struggle. This green girl who was bullied and shamed, reminded me that no matter what we go through in life, we can become stronger, better, healthier and wiser. Since New York and Boston, I have seen Wicked four additional times. With every visit, I continue to experience something I never had before. Every time I play the soundtrack, I can feel the vulnerability, see the journey and build the courage through every note. My office and my home contain memorabilia and artwork from Wicked. I have signed photographs and letters from Jackie Burns, who portrayed Elphaba in Boston and New York. Her voice and her passion brought me to tears. There is a photo of Christine Dwyer and me when she flew into Richmond. 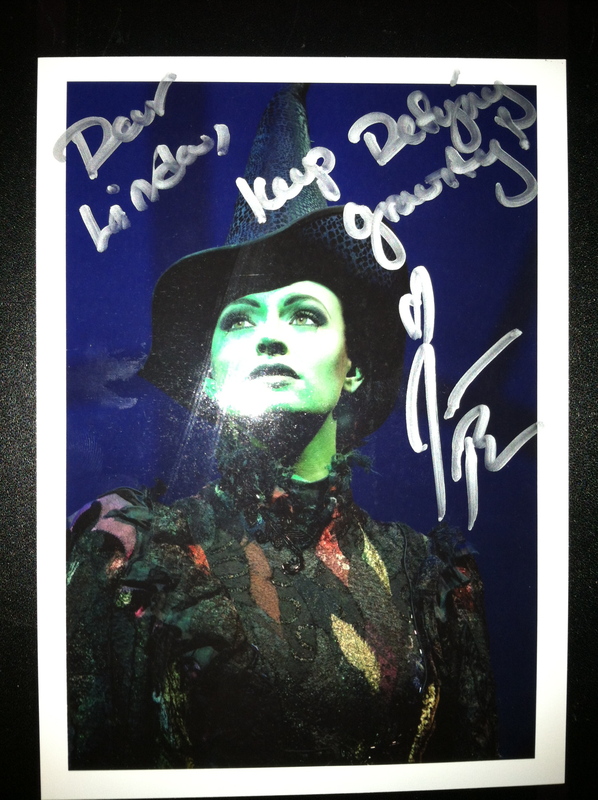 She was the Elphaba that I was finally able to voice the words, “thank you” to. Life is different for me now. I have acknowledged my part in all of this and the mistakes I made, through the help of a compassionately tough counselor and a couple of dear friends. I have to be honest and confess that it’s taken more than seventy times seven times to forgive. Just when I think I have, something else brings back the memories and the hurt. Life is better though. My yellow brick road has taken me into a new direction with some significant changes, inside and out. I am a different person because experiences like this will change anyone. Thankfully in my case, I am changed for the good. My demeanor, attitude and spirit are unfamiliar to me and I am still getting to know them. There is gratitude for the fact that I do have a scarecrow or two in my life, along with a tin person and a brave lion who have been with me on this journey. I lost a couple of friends but gained some along the way. Unfortunately we don’t see each other as often as I would like but they are right by my spiritual side whenever I need. There aren’t many Glindas or Dr. Dillimonds around because trust has become a factor and I am working through that. That is harder than I imagined it would be. And I don’t trust anyone that hides behind a curtain of control, or a mask of manipulation either. I am waiting for Fiyero to dance into my life, the one who will look beyond the green, see the heart that is inside and fall in love with the good. As I consider that though, I realize how much I am learning on this yellow brick journey, even as I write this. Before anyone else is willing to see through my green shell, I have to be able to do the same. I have to be able to see through the green and into the heart of a vulnerable girl who wants to be a voice for the voiceless, including my own. She wants to find family, friends and faithful confidants who will stand with her, be with her and love her unconditionally, through words and through actions. She wants to meet the girl underneath the green that is vulnerable, strong, misunderstood, and yet can defy gravity in ways she doesn’t even realize yet. It takes time to recover from the drowning shame and feelings of worthlessness. Trust in people who are on the road with me becomes hard to build and sustain, without fear that someday they will leave me too. But things are coming back around. It’s been a long, hard fought couple of years and the tornados are just starting to pass. 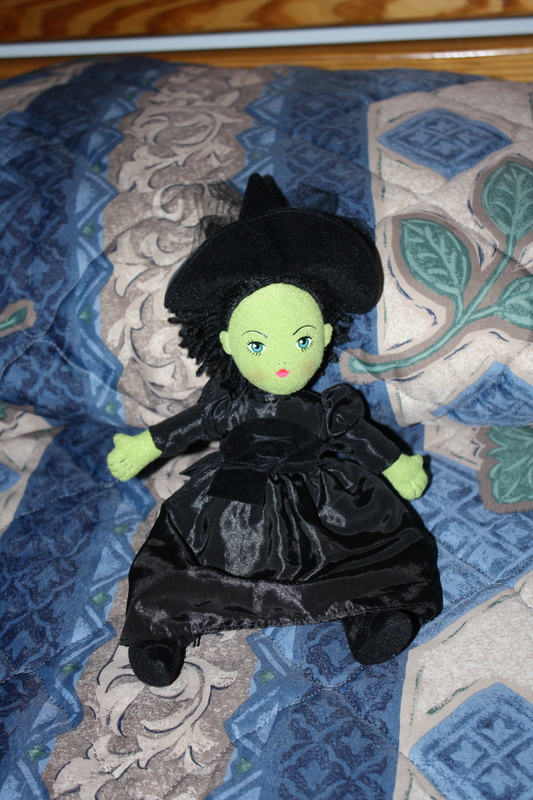 Elphaba is with me everywhere I go, literally and figuratively. She is my constant reminder of a time I was able to escape this ugly world into a magical city of emerald and glitter. She is also my saving grace that is heard in my inner voice and felt with the handprint on my heart, telling me to grab my broom, my Grimmerie and know that whatever is ahead of me, whoever I meet along the way, my story will be re-written – for the better. Thank you for allowing me to go off course a bit with this entry. This has been therapeutic for me and one I would not have considered sharing if I weren’t in a better place now. This gift or curse I have inside is still searching for a solid place to stand and take flight. I’m not at the point of feeling unlimited yet, but I am feeling the strength to be able to defy a few things in the process. And for that, I am good. This entry was posted in Uncategorized and tagged defy gravity, Elphaba, evil, journey, trust, vulnerability, Wicked the Musical. Bookmark the permalink. 1 Response to Why Wicked? Why am I so Passionate about Wicked and Elphaba? I love this! I haven’t seen “Wicked”, but OH how I relate to this! I am still licking old wounds and trying to figure out what a trip the 40’s are, as I finally start to find my voice and set boundaries. It’s so tough!!!!!!!!!!!!!!!!!!!!!! Is that counselor in Richmond, by chance?